NICER's mirror assemblies gather data about the interior of neutron stars, including flashing pulsars from across the sky. For centuries, travelers have navigated by the stars. Now, a new experiment on the International Space Station shows how spacecraft to the outer solar system could one day use special pulsing stars for guidance. In a demonstration on the International Space Station, a new piece of technology calculated the orbiting platform's precise position in space without looking back at Earth, thanks to the help of distant stars called millisecond pulsars that flash at precise rates. When a massive star explodes in a fiery supernova, the object leaves behind a neutron star. This incredibly dense, city-size core has the mass of the Earth's sun. Some neutron stars spin rapidly, flashing beams of energy like a lighthouse as they sweep by Earth. The most rapid of these are millisecond pulsars, whose fast-spinning strobes flicker multiple times every second. Some pulsars, including those relied on by the new program, are so stable that their pulse arrival times can be predicted to accuracies of microseconds for years in the future. Last June, NASA's Neutron-star Interior Composition Explorer (NICER) instrument was installed on the outside of the space station. For the last six months, NICER's 52 X-ray telescopes have focused on studying neutron stars, including pulsars. In November, the telescopes went from serving as science instruments to operating as navigational tools, thanks to the Station Explorer for X-ray Timing and Navigation Technology (SEXTANT) experiment. While ancient mariners navigated the seas using conventional sextants with any known star, the new SEXTANT relies on millisecond pulsars. As the International Space Station zipped through space at just over 17,500 mph (28,000 km/h), SEXTANT stopped receiving the space station's location information, and the instrument had to figure out where it was in space on its own. Instead of looking back toward Earth, SEXTANT turned NICER's telescopes toward four previously selected millisecond pulsars. An illustration of the NICER mission aboard the International Space Station. 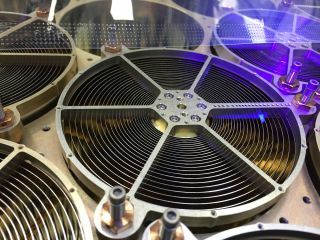 Researchers turned NICER's 56 X-ray telescopes toward four stars called millisecond pulsars to independently locate the position of the space station. In under 8 hours, SEXTANT was able to calculate its location within the targeted range of 10 miles (16 km). According to SEXTANT Project Manager Jason Mitchell, an aerospace technologist at Goddard Space Flight Center, a good portion of the data showed positions that were accurate to within 3 miles (5 km). While that isn't fantastic compared to the accuracy of GPS on Earth, or for navigating low-Earth orbiting objects, Gendrea said, "Going to Pluto, this type of system has much better capability than we currently have anywhere." He added that further refining should help push down the errors to within a kilometer (0.6 miles) by the end of 2018. NASA's New Horizons spacecraft, the fastest mission ever launched, took 10 years to reach Pluto. Like most spacecraft, New Horizons used the Deep Space Network (DSN), a set of telescopes spanning the globe, to calculate the probe's distance from Earth. But a signal took 4.5 hours to reach Pluto and another 4.5 hours to be sent back. Any course calibrations the spacecraft made required waiting for the signal to arrive from Earth. By measuring how long it takes for the signal to arrive, the spacecraft can calculate precisely how far away it is from home. Because SEXTANT relies on pulsars instead of signals from DSN, Gendrea said the new system should help improve accuracy when determining spacecraft locations. "DSN can help figure out that you are so many centimeters away from Earth," Gendrea said. "But in the cross direction, you have very poor information." If traveling through space is like hiking across a vast national park, then using DSN is much like finding your exact location when you know only precisely how far you've come from a single landmark. Sure, you have an idea of which direction you set out in, and you can look around to see if you're in the right region by looking for (but not measuring) other landmarks, but you would never know exactly where you were. By including multiple pulsars — four, for this run — SEXTANT triangulates location to a single point. That could mean a huge help for DSN, which currently manages communication with anywhere from 40 to 50 deep-space, lunar and human missions, as well as ground-based science missions, according to NASA's Jet Propulsion Laboratory. The NICER mission aboard the International Space Station scans the sky with 56 X-ray telescopes. "We are hoping [that] with pulsar navigations we can significantly reduce the load on that system," Gendrea said. While the initial run used 56 parallel X-ray telescopes, a mission to the outer solar system wouldn't require nearly as many instruments. Gendrea said that a single, poster-tube-size instrument, weighing about 5 kilograms (11 lbs. ), could serve as a navigational beacon. "With that size, we don't expect the cost to be very large," he said. Further cost savings would come from not using resources from the DSN, he said. Because SEXTANT relies on an X-ray telescope, the navigation tool could even be used as a science tool. "In some sense, it's priceless," Gendrea said.